I appreciate your observations about having “potential.” I know that can be quite paralyzing. My task to you is to connect deeply to your work and let go of why you’re doing it and what the outcome may be. Try to work on flow. Work on “what am I going for here?” instead of “what does this mean for me as a writer?” If I haven’t suggested THE VAN GOGH BLUES by Eric Maisel to you before, let me suggest it now. Maisel talks about a writer’s need to make everything mean something. My suggestion to you is to try to stop searching for the meaning in your process and just fall into these amazing, affecting stories you tell. Revel in the work. Enjoy being a writer. At the time, I shrugged it off (sorry, Nancy, I was young and foolish). But since then, it’s floated up from the depths of my subconscious. See, humans instinctively look for patterns in things. We try to order the universe in a way that makes sense to us. Often, we do that by making up stories. Writers especially do this—making up stories is our thing. And so, we try to apply narrative structure and plot principles to reality. This is really hard but it’s okay—this is the part where the hero is in despair, but they don’t give up, and then after the big struggle, they get the crown and glory. It’s just the descent into the underworld. We’re at the “trials” part of the story. If we keep going, they’ll end soon. This is just the dark night of the soul. Everything looks like angst and despair now, but it’s actually transformation. It’ll end. It’ll pass. And in the end, everything will be better. 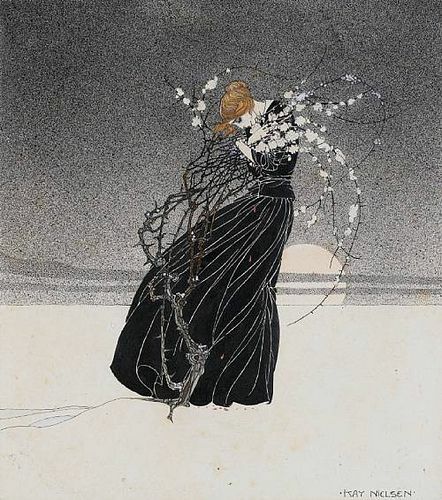 From “Among Elves and Trolls,” John Bauer (1912). To an extent, that’s helpful. If it keeps you putting one foot in front of the other, then it’s got some merit. Wait a sec—if I do the trials, they’re supposed to end at some point. Okay, okay, so I’ve been waiting through this dark night for a real long time. I don’t think I’m transforming. I’m not giving up, so where is my crown? This isn’t the way the story goes. 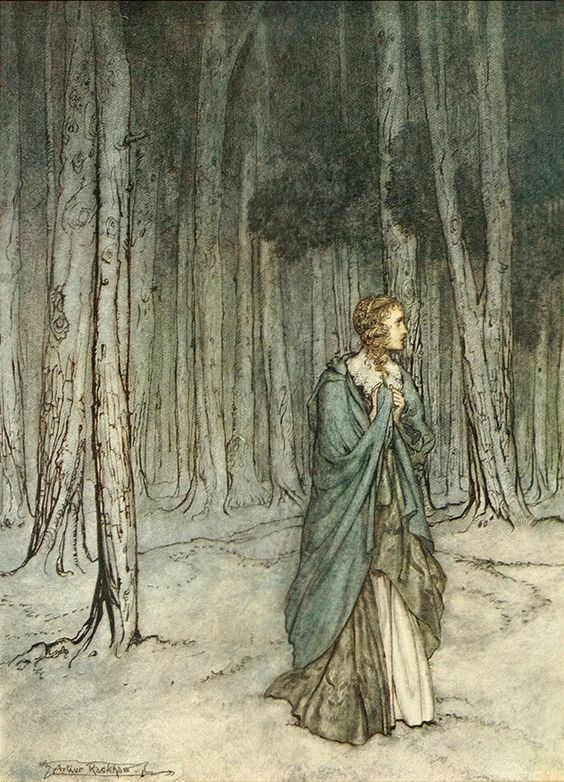 “The Lady Enters,” Arthur Rackham (1921). Cycling back to Nancy’s advice, it can be paralyzing to apply this logic to our work and careers. We hunch over submissions responses like auguries over tea leaves, forecasting our writing lives. Another rejection? And another? After all this struggle? Well, this isn’t the way the story goes, so something is deeply wrong. With you. Obviously. But even worse, I think—in stories, a taste of success means that more is coming and we’re shifting into a new act. Any glimpse of light is the first ray of dawn breaking through the soul’s dark night. And so when the morning doesn’t come—when we’re plunged into darkness and struggle deeper than ever—it feels wrong. This isn’t the way things go. It’s imposter syndrome with the fatal perfume of plausibility, because hey, you got stuff out. People saw it. And now? Right. They figured it out. So every moment—every step on the journey—becomes a plot point. It foreshadows everything else. And when the story doesn’t follow our accustomed structure, we feel like failures. But here’s the thing: reality doesn’t plot well. The writing life isn’t a story. It’s the most unpredictable, least logical field out there. It’s not foreshadowing, it’s down to circumstances that we can’t control and that change by the minute anyway. The only caveat I’ll throw in is that sometimes, yeah, you do need to up your game, craft-wise and art-wise. That’s where I am. …stop searching for the meaning in your process and just fall into these amazing, affecting stories you tell. Revel in the work. Enjoy being a writer. I know one thing for sure. There is no sure way to succeed in the arts, but the best way to fail is to stop trying. We got into this whole creative thing because we love it, right? 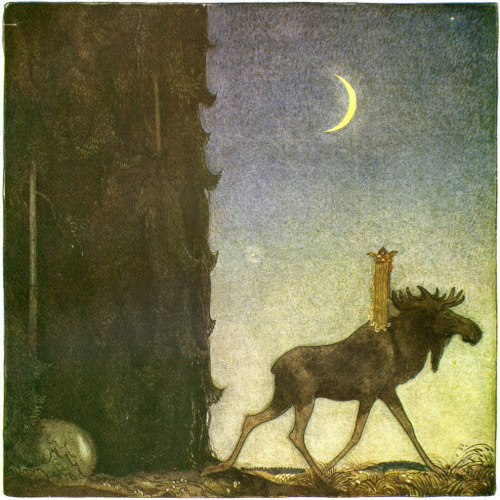 “Leap the Elk and Princess Tuvstarr,” by John Bauer (1913). Then we should love it. Because we don’t know how long the road goes, and we don’t have a map to predict its twists and turns. In the end, that love—that revelling—is all we have. I just discovered “Down by the Salley Gardens,” and honestly, I’m surprised it took me this long. It’s the lilting-haunting-lost-love sort of piece I love. 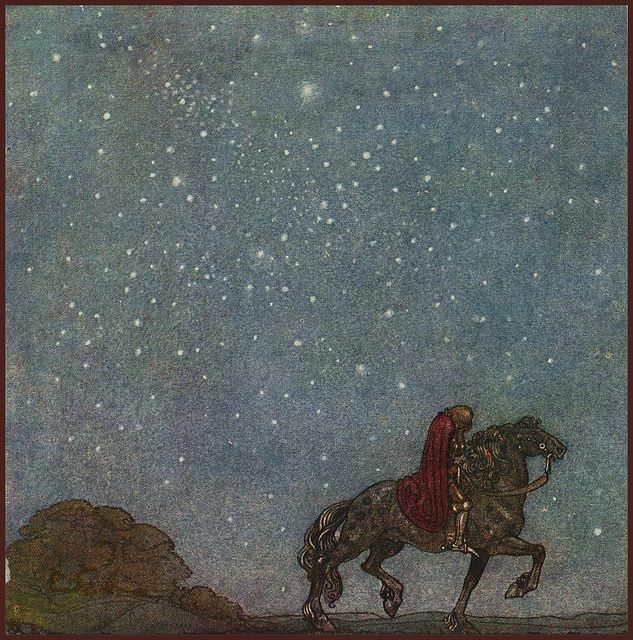 Plus, it’s a setting of a poem by Yeats, whom I adore. Add in a solid treble voice, and I’m in.